Vanuatu’s former Lands Minister Ralph Regenvanu has described as disturbing indications from his successor Paul Telukluk that he will peel back the recent major land reforms. 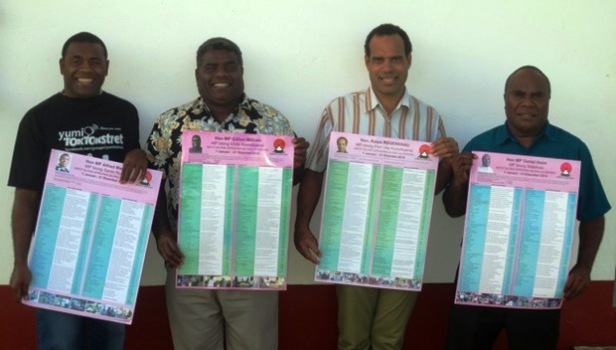 Ralph Regenvanu (second from right) is Vanuatu’s former Lands Minister, and is warning that two years of important reforms will now be scrapped. As minister for around two years until last month’s removal of the Joe Natuman-led government, Mr Regenvanu drove major reforms in areas including the management of customary land and putting curbs on ministerial powers to sell state land. He says Mr Telukluk is set to change all this. Ralph Regenvanu says Mr Telukluk appears to lack a public mandate for repealing the land reforms.